Twice daily Andy Lockey makes the trip around one of the WA Wheatbelt’s oldest tourist destinations, Granite Way. But the feral animal trapper of more than 30 years isn’t stopping to admire the striking slabs of granite that stand out from the surrounding farmland. He’s checking his 150 or so feral animal cage traps scattered at the bottom of each rocky formation, as part of a new program targeting native animal’s enemy number one. Feral cats have contributed to the extinction of several mammals and ground dwelling birds and threaten the survival of more than 120 native species in Australia. When the stomach contents of one feral cat were examined near Roxby Downs in South Australia, conservation group Ecological Horizons found 29 native dragons, three skinks, one mouse and one zebra finch. The Australian government has already declared war on the feral animal with a target of 2 million feral cats culled by 2020. “We check the traps first thing in the morning, then late in the afternoon,” Andy Lockey said. “By keeping the bait fresh, we stand a much better chance and we’re using everything from rabbit to fish, to see what works best. Andy Lockey said the project was different to other culling efforts because it engaged landholders in the hope they would take over maintenance of the gains made so far when government funding ran out. The Coordinated Predator Control project was currently funded by both the State and Australian governments and coordinated by natural resource management group Wheatbelt NRM. The success of the program has already attracted national attention, with the country’s first appointed Threatened Species Commissioner travelling from Canberra to north of Kellerberrin to visit the site. Gregory Andrews was so impressed with the work being done he wanted to see it first hand. He visited the property of John and Natalie Hammond, found at the foot of Mt Stirling. The couple’s two sons Hudson and Harrison have been actively helping to keep the feral cat numbers down, through the use of a cage trap. “Each night a feral cat can consume a minimum three to four native animals, which means each year they’re responsible for the destruction of more than a thousand,” Gregory Andrews said. Wheatbelt NRM’s program manager for biodiversity Rowan Hegglun said the project had come about because of the need to protect the vulnerable Black-flanked rock-wallabies. “We know these wallabies live on Mt Caroline, Gundaring and Sales Rocks,” Rowan Hegglun said. “There are only seven known populations left in the WA Wheatbelt and we know they’re not thriving, so we’re trying to address one of the likely threats. “Addressing the rabbit population is one strategy, as they are likely to be providing a food source for one of the likely culprits, which are the cats. Rowan Hegglun said there was a small window of opportunity to catch the cats before more feed became available. “This is usually during late winter and early spring,” he said. The project has captured the attention of Murdoch University, which is collecting frozen carcasses to analyse gut content. 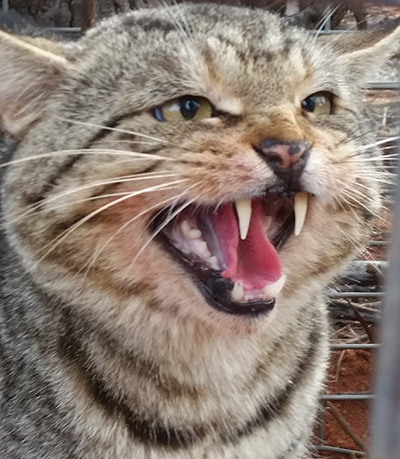 Dr Peter Adams from the School of Veterinary and Life Sciences was part of the research and said by examining the digestive system, it was possible to measure how much damage feral cats were doing. “We’re keen to investigate which species is responsible for predating rock wallabies,” Dr Adams said. “We want to find out if it is foxes or cats, and if it is cats, whether it is all of them or only a few ‘super-killers’ and if they only hunt the wallabies at particular times, such as when they have pouch young or young at foot. “We know feral cats are big consumers of native birds and marsupials as well as reptiles and invertebrates. Rowan Hegglun said the focus on trying to manage feral cats around the granite belt was a benchmark program. “We’re trying to get landowners involved as much as possible, so we’ve given them traps they are responsible for setting and clearing,” Rowan Hegglun said. “Eventually we will have to phase out full time professional trappers from this program, so we don’t want to see all this work go to waste. About seven landholders have been involved in the trapping program, including the Hammond family. “We think the impact has been huge, just based on our own sightings and hearing about the drop in livestock deaths,” Natalie Hammond said. Wheatbelt NRM’s Rowan Hegglun said current funding for the project would finish at the end of this year. “We’re looking to extend the project through other funding sources, but for now we know the program is benefitting the rock-wallabies as they are starting to come down from the rocks,” he said.